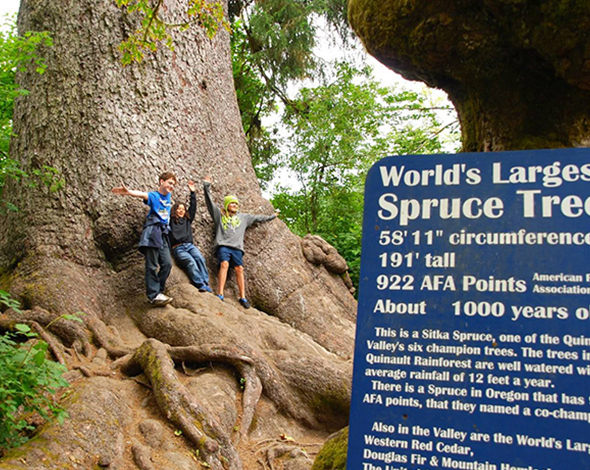 At a circumference of nearly 60 feet, this giant spruce is the largest in the world. 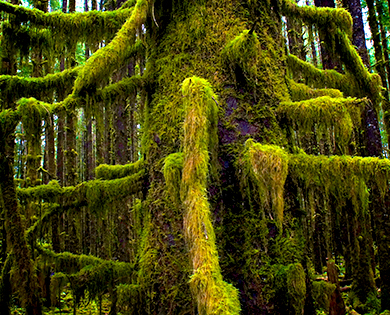 Moss, giant spruce... and yes, lots of rain! 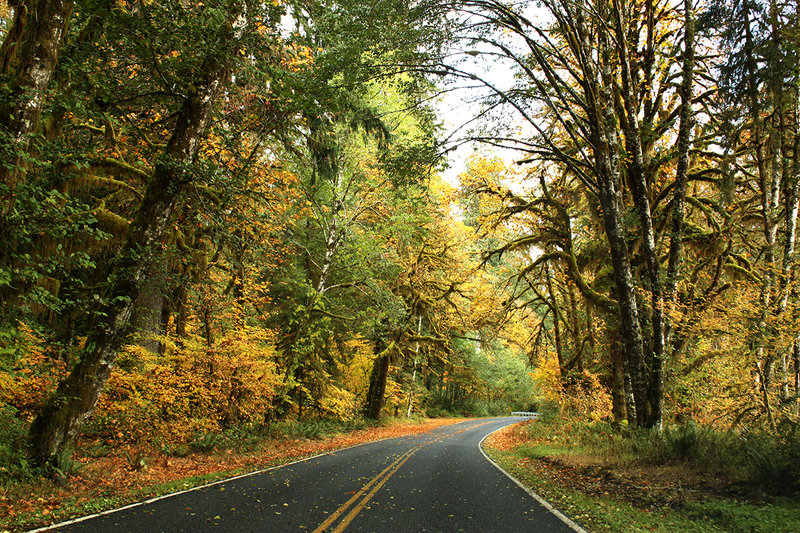 Driving hubs-deep through the river rippling over State Route 109 on the way to the Quinault Rainforest felt badass. It was one of those Pacific Northwest December storms where stepping outside feels like stepping into a shower. Rain drops? HA. This was like driving through a car wash. Why not go to the rainforest when it’s really dumping? Summer is for amateurs, I said to myself, splashing through the stretch of road that had become a temporary tributary of the Moclips River. Rainforests are best enjoyed in the rain! Right? I complained about our road trips to the rain forest, but secretly I was proud that I’d camped on the shores of the Bogachiel, eaten steelhead my uncle pulled out of the Hoh, and lived the damp mossy dream." 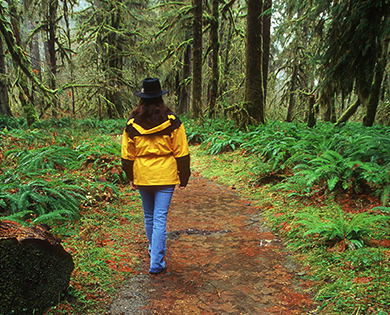 Growing up on the Olympic Peninsula, my parents hauled me on the two-hour drive from Port Angeles to the Hoh Rainforest often enough that I’d groan ‘Not Forks again!’ when they woke me up early on a Sunday, planning yet another adventure. I complained, but secretly I was proud that I’d camped on the shores of the Bogachiel, eaten steelhead my uncle pulled out of the Hoh, and lived the damp mossy dream. I felt indulgent towards the tourists who flocked to my home every summer to be gobsmacked by the green I took for granted, the place names I knew how to pronounce because I’d grown up with them. 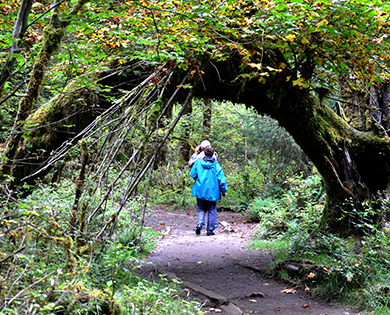 A couple enjoys a pleasant hike on one of the short loop trails in the rain forest. 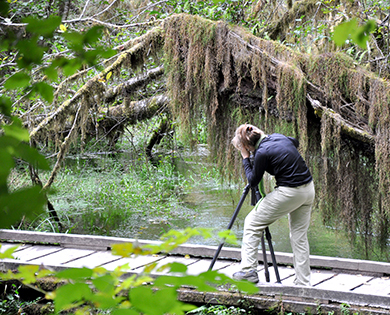 With draping moss and lilly covered ponds, photographers have little trouble finding the perfect subject. The oxygen in the rain forest is so thick it nearly takes your breath away. Hoh, Queets, Quinault, Bogachiel. The names sound like a druid’s chant. Repeating them might summon up a mythical forest beast or invoke a tree to speak. The rainforests are all named for the Olympic Mountain river valleys that contain them, east to west glacier carved ‘U’s that protect from wind yet trap rain, growing forests like no others in the world. 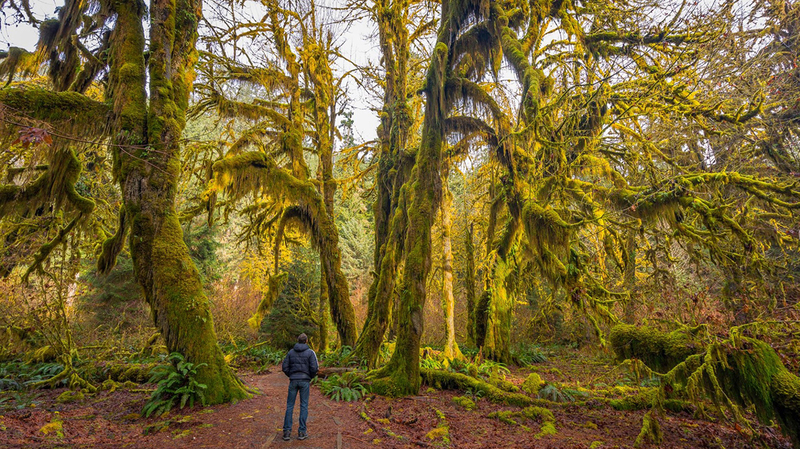 The Quinault Rainforest is just 30 miles from the Pacific Beach area of Washington’s north coast, where I was staying with my family on a pre-Christmas vacation. 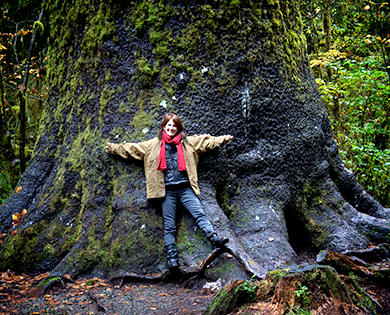 And since one of the best things about being a parent is doing to your kid whatever your parents did to you, I figured an easy adventure through the wet to hug World’s Largest Sitka Spruce would be a fine family outing. Besides, I have a thing for these gray barked behemoths. They only grow in foggy coastal areas in a range that stretches from Oregon to Alaska. They thrive in the shade. 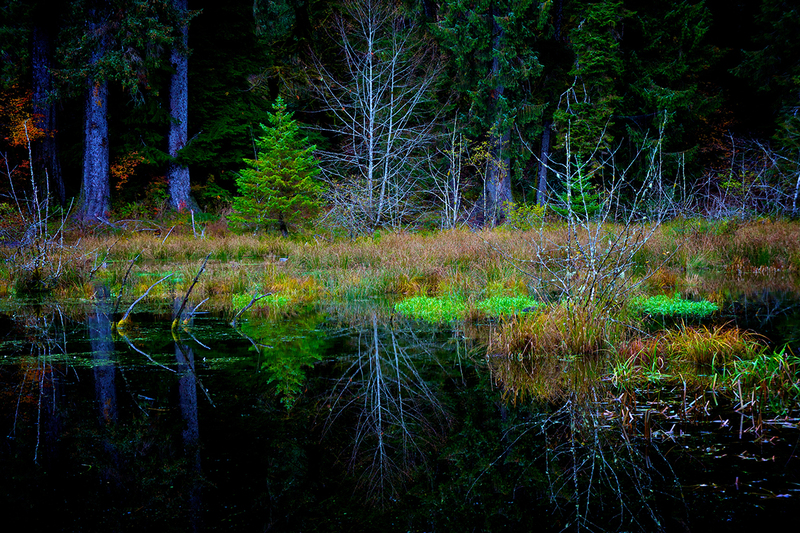 For millennia, Sitka spruces have had one thing dialed in: coping with wet, dark days. I figured I’d go do some literal forest bathing and get a tip or two on surviving the PNW’s darkest, dampest days from that ancient tree. The rain was at firehose level. Our dog, who loves to swim, cowered and refused to come out of the car. We clipped her leash, tugged her out into the deluge, and set off down the trail. Which, we discovered after the first bend, was completely underwater. Our knee-high rain boots weren’t gonna cut it. Hip waders might not have cut it. My daughter, husband and dog retreated to the car. I found another Sitka spruce that was not “The World’s Largest” and communed briefly with it, touching the rough fish scale bark and admiring its dripping moss. It told me to go inside and dry off. 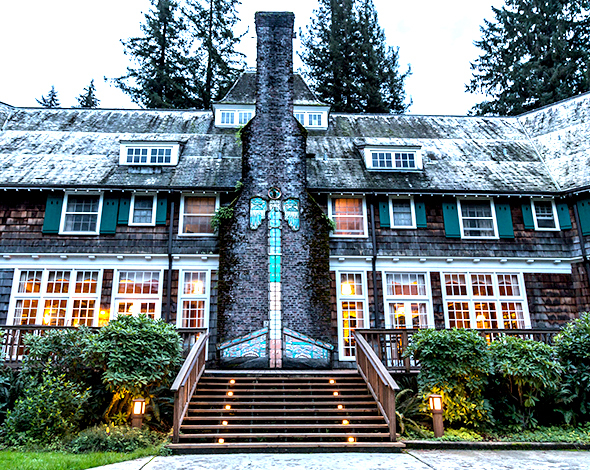 We heeded that wise counsel over hot chocolate and a couple of pints of beer in the lobby of Lake Quinault Lodge. A fire crackled on the hearth. The air was so wet that the opposite shore of the lake was invisible. Foul weather fortitude is overrated. 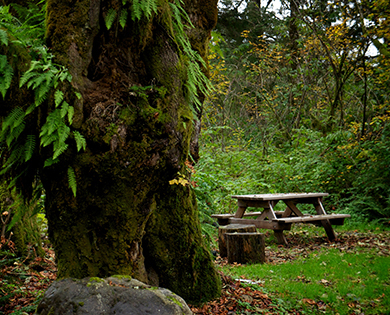 The best way to do a rainy-day rainforest outing is to take shelter in a cozy spot and watch this place do its thing.